On the north Cornwall coast lies the olde worlde fishing village of Padstow and Rick Stein’s famous seafood restaurant. There’s plenty of action going on in this neck of the woods, including offshore shark fishing. 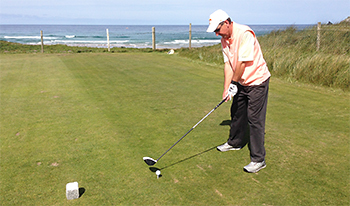 And, there’s also plenty of excitement at Trevose Golf and Country Club, located a little further south, along the Atlantic coastline at Constantine Bay. With dramatic views across the golden sandy shore of Boobys Bay to the rugged coastline of Trevose Head, it’s sheer drama. Founded in 1926, the great Harry Colt designed the Championship course at Trevose, and Sir Guy Campbell made minor revisions just before the Second World War. It’s an exhilarating windswept links where little else other than dune grasses survives in the bleakness. Trevose is a stern test of golf, especially when the wind is up. There are four teeing areas to choose from, and the par 72 (73 for the ladies) links stretches out to a stern 7,172 yards from the back tees. The crumpled fairways are generous in width and the rough is kept short to keep up the speed of play and prevent too many lost balls. Some regard Trevose as holiday golf, but the course is technically challenging and will test the very best golfers. The course record of 66 stands as a testament to its level of difficulty. Birdie opportunities are there for the taking on the three short par fives, but make the most of it because many of the par fours are aggressive and supremely challenging. Five of them stretch out over 400 yards. The short holes are also memorable and exciting, especially the 3rd, measuring 166 yards and the 199-yard 11th, with its two-tiered plateau green. The photogenic par five 4th hole is renowned for its glorious greensite location, set hard against Boobys Bay, but many felt the hole failed to live up to its spectacular backdrop. In 2016, as part of Mackenzie and Ebert’s masterplan, the 4th was overhauled with new tees, bunkers and a massive new undulating green. The club is clearly not content to rest on its laurels. Seven holes have already been extensively reworked. In 2018 work on the 14th, 15th and 16th completed, which included bunker modifications, extensive green surrounds work and the opening up of bare sand areas to rejuvenate habit and add interest to this trio of rather dull holes. Some excellent facilities accompany the testing Championship course and there’s a very pleasant nine-hole course, designed by Peter Alliss, called the Headland. This shorter course is an nice warm-up ahead of Trevose's real Championship challenge. Compared to its neighbouring links courses (West Cornwall through to St Enodoc) Trevose is a different kettle of fish. On much flatter land it’s a classic case of what you see is what you get. There is no trickery, blindshots etc and there is plenty of opportunity to give the driver a nudge. The opening holes play close to some nice dunes but the rest of the course is quite flat. It’s difficult to compare to St Enodoc as they play so differently. Trevose is more of a championship design and I would imagine it would get more serious tournaments than St Enodoc . The greens are large and smooth, fairways quite generous, rough dry and wispy and all up you should score well here if you get the benign conditions presented to me. The bunkers were interestingly placed. On still days I would imagine they trap the serious player from the blue markers but a decent player from whites, and especially yellows should be able to easily clear most of them. In windy conditions bunkers could be anywhere and be in business. With the exception of Perranporth (which I last played eighteen months ago) I’ve replayed all of Cornwall’s coastal courses in the last three months. I was especially keen to see Trevose again after the renovation work that’s being undertaken by Tom Mackenzie. Despite its Brabazon credentials and its gorgeous setting, I’ve never really warmed to Trevose. It’s a long course that can be stretched to nearly 7,200 yards from the blue tees, but it has always felt like holiday golf. Sadly the new raised green on the signature par five 4th hole was out of play last Thursday, it played to a temporary green. The new fourth green looks excellent and I’m sure it will cement this hole’s place as the best on the Championship card. The club is working hard with Natural England to clear the scrub from the dunes. The work in progress is to be commended but unfortunately there isn’t quite enough duneland to go round the whole property. The new irregularly shaped, rugged bunkering has improved the aesthetics on many holes, but to my eyes these new traps don’t yet look completely at home. Hopefully in time they will settle into their surroundings. Currently there’s a mix of revetted and rugged bunkering in play and the plan is to remove all revetted traps and return the course to its apparent former rugged look by 2019. It’s seems a shame to lose the excellent revetted traps as their sharp lines suit my eye better in this relatively gentle landscape. Something was required to breathe life into the flat and uninspiring holes on the backside (14-16). These are much better now with the new traps adding focal definition and strategy. I’m still not a fan of Trevose, despite all the good work. Maybe once the programme has completed next year I’ll warm to it. There’s no quirk here, unlike Trevose’s Cornish counterparts at St Enodoc, West Cornwall, Perranporth and Bude. It’s hard to know what strategy the club is aiming at. Is it a championship layout or a holiday course? The club seems to be focusing on the latter rather than the former, but maybe I caught Trevose on a warm, benign, late spring day and I’d like it more in the wind. As it stands, I am hard pressed to award Trevose a 5-ball rating. It’s a good course but not great in my opinion. However, I think a 4-ball rating is harsh and 5 generous. Damn… rating courses is way too hard. We must alter the rating scale at some point. I had the misfortune to time my trip to Trevose at the same time as the 'Beast From the East', which provided a brutal combination of high winds and low temperatures. Despite prevailing weather conditions, I greatly enjoyed 36 holes at Trevose. The opening hole is a fantastic one, with penalising bunkers in play from the tee and bunkers obscuring the view of the green, a challenging and interesting first hole. The second follows in the same vein, another downhill tee shot providing brilliant views of the dunes and sea to the rear of the hole. I do leave disappointed that on my visit the 4th was out of play, as I would have loved to face the approach shot to a green framed brilliantly by the famous rocks and lashing waves (which had not put off many foolhardy surfers despite plummeting temperatures). I do fear that my admiration for the golf course was at its highest during these first 4 holes, thanks in large part to the ocean views. The 5th played straight into wind and was a brute of a hole, and the 6th downwind less so. The 7th was another notable hole, which a very undulating green you do not want to find yourself the wrong side of. Personally, the front 9 exceeds the back, largely perhaps due to the ongoing course renovations. But condition aside, the back 9 offers up less memorable holes. The pick of the back 9 for me being the par 3 11th, par 3 16th and par 4 16th. Overall enjoyed Trevose greatly, greens were in fantastic condition given the time of year, as in large part were the fairways. Some terrific golf holes on the front 9, and a fair test of golf. 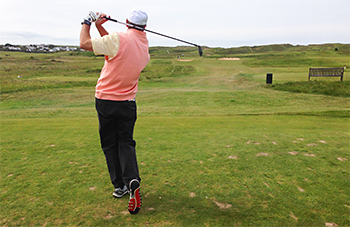 I played Trevose again last August and found it still a bit disappointing. The views from clubhouse are superb with some interesting holes on the front side, but there’s nothing much to stick in the memory on the back side except for the last strong par five. Conditions were not great when I played here either. I feel It’s overrated in relation to nearby Perrnporth. I entered the Westlake Trophy at Trevose and arrived the afternoon prior and headed to the course to check out the practice facilities. The entire course is laid out below you from the elevated clubhouse but as it was shrouded in sheets of misty October drizzle, or “mizzle” as they call it here, I didn’t really get a chance to appreciate the setting. What was appreciated was the super little range with its inventive targets and very useful small indoor putting green in the cosy foyer building. In the dead calm of the next morning Trevose was waiting for me in all its glory. The colossal desert like sandy dune face behind the 2nd green and further beyond the ocean brushing against the iconic sea rocks and jagged cliff faces out by the 4th green were landmark features that strikingly seemed within touching distance of the clubhouse. The conditions remained virtually dead calm all day long, most unusual for any seaside location, with not even a one club breeze applying, in fact not even 2/3 yards of ‘hurt’ at any stage. In many ways a true test of a links layout is the challenge it presents on a calm day such as this and Trevose was demanding underlined by the average CSS of +3 per round reported for the Westlake Trophy 36-hole competition. Playing two rounds in a day in a competitive environment is probably one of the best ways to experience a golf course you have never played, albeit playing off the back tees can sometimes take the fun out of it, depending obviously on your level. For me three of best holes on the course come very early, the 1st, 2nd and 4th, the only section of the course that is set amidst the high dunes. The 1st is a superb downhill par four that meanders its way through dunes punctuated by gaping bunkers and a downhill run to a green that slopes back towards the fairway. The par four 2nd continues the downhill trend with a fairway guarded by four bunkers and a magnificent approach played to a green protected by three more bunkers and overlooked by the huge imposing Sahara-esque sand face behind. Not to discount the 3rd, it is a solid par three played from on high across a valley to a green with trouble on all sides including three nasty pot bunkers, yet with an inviting bowl in the middle of the green that can be quite rewarding. The 4th is the signature hole at Trevose, a dogleg left par five played from a high tee down to an undulating fairway, guarded by bunkers and an approach towards the ocean and “Booby’s Bay” beach. Most available photographs of this scene tend to capture the ocean at its wildest in the background, however it was dead calm when I was here. The 5th and 6th take you to the northern half of the course (where the 12th, 13th, 15th and 16th are also routed), which is little bit less memorable, yet does present some strong holes. The bunkerless 5th is a tough dogleg left par four, the generous fairway offset by the long uphill approach to a stubbornly elevated green. The 6th offers some respite as a shortish par four with a big green. Then the 7th takes you back towards the low-lying section of the course closer to the larger dunes, another difficult par four with a long approach to an elevated green, one of a few holes on the course with a steep upslope before the putting surface. The relatively short par three 8th probably makes it into my top-five holes on the course, played over the valley of a burn to a green with three deep pot bunkers short and left and a steep grassy fall-off to the right. The front nine closes with a par five that offers two routes off the tee either side of three fairway bunkers and another steep rise to the green, this one steeper than most. The 10th hole is another of my favourites, a par five with a downhill tee shot to an open fairway and a burn and three bunkers to negotiate en route to the green. The 11th is a tough par three that required a wood for me in both rounds from its highly elevated tee to a green also elevated with three bunkers to consider. The 12th is a long uphill par four towards the northern boundary of the course, with two grassy bunkers forcing you to think twice about cutting the corner and another large bunker short and left in the steady incline towards the green. The 13th is the last of the par fives, curving to the left from tee to green, the tee shot played slightly downhill and the second shot down again to an open flat fairway that sets up a tricky approach shot to a green with bunkers short, and with a hazard left and long to take into consideration. The green is in three sections and it is particularly hard to get close to the flag of it is in the back left corner. The closing stretch begins with two short par fours, the 14th the shorter of the two and really only requiring a 240-250 yard tee-ball short of the four cross bunkers, which leaves just a wedge approach to relatively straight-forward green. Whilst the 15th doglegs slightly to the left, a tee shot bailed out right will still leave just a short-iron slightly uphill to a green that slopes from right to left, the back left pin position being the most dangerous given the slope off the left edge of the green. The 16th, like the 11th, is a 200+ yard par three that will frequently demand a well struck wood off the back tee to a green that has two grassy mounds in front of it, the main complication other than the sheer length of the hole. The 17th is another of the top holes on the course, a demanding par four with a narrow fairway that must be found off the tee in order to ensure the good lie you need to be able to take on the green with your approach, as the burn (that also features on the 10th fairway) protects the front of the green and will gobble up anything half a club short. The 18th is a tough finisher, uphill all the way requiring two solid smacks off the back sticks to make the green, which has bunkers short on either side and O.B. long and left. The appeal of this hole is somewhat undermined by the road that crosses the fairway around 80 yards short of the green on which vehicles have right of way and tend to avail of this right without looking around to check if a golf ball is about to crack a windscreen. Trevose Golf & Country Club is a real darling of the South-West golfing tapestry. Its three courses, on-site accommodation and reputation for excellent catering make it a highly popular and desirable venue for golfers and their families flocking to this part of the country. Each time I have visited there has always been a lovely feel and buzz to the place. The main links, designed by Harry Colt, regularly ranks as one of the top golf courses in the British Isles and as the proud host of The Brabazon Trophy (2008), The McGregor Trophy (2012) and the English Men's County Finals (2017) Trevose enjoys a real championship status. A maximum yardage of 7,172 from the blue tees confirms the challenge. All lies before you from the 1st tee with an expanse of small sandhills to the right, larger dunes to the left and the sight of the Atlantic Ocean in the distance; a truly breathtaking vista. You can also spot several flags fluttering nonchalantly away, many of them perched up high on the top of plateaus, and you just know that your creativity will be tested. The greens are quite large and the fairways certainly generous although new bunkering on many of the holes has tightened up the drives significantly. The greens themselves ran beautifully in the early season and were a joy to putt on. There are some real high points at Trevose which compare favourably to the very best of British links golf. The intimidating opening tee shot, the knob-to-knob par-three third and the iconic fourth hole, with white horse waves crashing behind the green, are early highlights. The seventh is also an exceptional golf hole with a green complex that is arguably the best on the course. Holes eight and nine complete a sterling outward half. In keeping with most Colt designs the course is set out in two loops of nine holes. The front half hugs the sand dunes and coastline, offering some spectacular views out to sea, and covers the best of the golfing terrain at Trevose. Meanwhile the back side offers a different, but no less demanding, test of golf as you head more inland. A good golf course rather than great golf course highlighted by the world class 4th hole. Holes 7 to 9 are very good. The scenery on holes 11 to 16 is ordinary as the terrain moves from the coast. However, the design of the holes is strong. The last 2 holes are excellent. I really enjoyed the round as Trevose is undoubtedly a really solid, honest test of golf. Interesting to see the disparity of reviews here, I must say I err with the disappointed. It's one of those courses where the view from the clubhouse and its standout hole (4th) can overrule the blandness of many of the holes which in part tend towards a field with flags particularly around the turn. Constantine's Bay is a lovely place to play golf but if short for time for me I would recommend St Enodoc, Perranporth, Lelant (West Cornwall) or Mullion instead for a beautiful yet fun golf course. The 4th edges it up to a 4 ball. Trevose is another wonderful links along the Atlantic coast of England. The course sits on some nice rolling land that flows down to the Atlantic. Only the 4th green is near the ocean, but the sea is visible throughout the course. The clubhouse sits on the highest part of the land and the front nine returns near to the clubhouse. The land is undulating but not severely sloped and there are modest but significant dunes through the property. After playing the wild and woolly links at Perranporth and the severe driving lines of St. Enodoc, Trevose is a nice breath of fresh air that gives you some room off the tee and numerous openings in front of the greens that allow you to play bump and run shots. The first is an excellent par 4 dominated by the dune to the right and the well placed fairway bunkers. Par would be an excellent start here. The par 3's were all well designed. The steep left to right slope of the third hole demanded a well placed iron, while the steep drop off to the right of the 8th with deep pot bunkers to the left made for a demanding tee shot. 11 and 16 were longer holes with severe sloping greens that would test a player of any caliber. I really enjoyed the par 4's on the back. 14 and 15 are beautiful back to back short par 4's that require a well placed drive but allow a multitude of options on the approach 18 is a demanding uphill par 4, 430 yards from the white tee and 478 from the blue. As with the first, par here is well earned. Trevose split the opinion of our group when we visited in April during a heat wave. There’s no doubt that this is a class course but compared to many of the other Cornish links courses it lacks the wow factor. The only sea views to be seen are shown in all the pictures of the 4th green which is set hard against the coast. There are no standout or signature holes, just one decent hole after another. Condition wise Trevose was almost as good at St Enodoc and it’s a much fairer course on which to score. However, it’s by no means a pushover and certainly gave my game a thorough examination. Drink the views from the clubhouse, they are exceptional, it’s just a pity you don’t get the vistas from the course. I think it’s a solid course but not quite in the same league as St Enodoc, even though St Enodoc has a couple of weak holes and Trevose does not. From the very first hole, I was impressed with the lovely springy turf of the fairways and high quality of the greens. Although the par fives are all relatively short, there are a number of par fours that are well over 400 yards. The holes run in every possible direction so judging the constant wind can be difficult. The 3rd and 4th are the only holes that actually run along the shoreline. Three is a good one-shotter of 173 yards over a thickly grassed valley and with one bunker on the right edge of the green. The par five 4th doglegs left, following the coast and runs down to a green near the water’s edge, overlooking Booby’s Bay. The 5th, index 2, is a very difficult par four of 466 yards. The hole runs away from the sea and doglegs left around the boundary. The par three 8th, where you play over a burn, is only 156 yards but anything hit even slightly right of the green will finish down a steep bank and if you are left then there are three bunkers awaiting. The par five 13th runs along the boundary so anything hooked is out of bounds. Two short par fours are then followed by the demanding last three holes. Sixteen is a very long par three of 229 yards. The par four 17th has a cluster of three bunkers on the right then a burn not far short of the green. The 18th will also test your ability to reach the green in two as it is 478 yards and uphill all the way.